​THE LINCOLN MEMORIAL on April 7, 2017! Welcome to Washington D.C. - The Nation's Capital! Performance TBA - POSSIBLE PERFORMANCE OPPORTUNITY: It is possible to perform at the many different memorials and monuments. An application procedure must be followed. Please notify our office for specific details. Chairs & Music Stands will be set up for your performance. Boxed Lunch (delivered) - Enjoy a delicious delivered boxed meal to any location of your choosing. 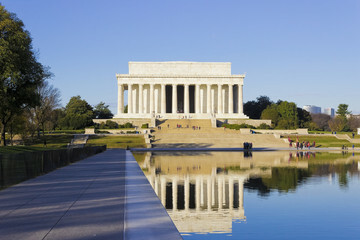 Visit the National Mall - Enjoy the National Mall, an outdoor festival / open air marketplace. It stretches from the Lincoln Memorial to the Capitol Building and is bordered by some of the world's most famous museums. You will be counted as part of the 20 million plus visitors who take the delightful stroll along this broad sweep of lawn annually. Tour John F. Kennedy Center for the Performing Arts - A tour of the John F. Kennedy Center for the Performing Arts, situated on the banks of the Potomac River, is a highlight of any visit to Washington, D.C. As the nation's performing arts center and a living memorial to President John F. Kennedy, the Kennedy Center welcomes three million visitors annually. The tour highlights the historic events that led up to the establishment of a national cultural center, as well as an interactive exhibit on the life and presidency of John F. Kennedy. Eat & Play at Dave & Busters - Great food combined with state-of-the-art videogames and simulators make Dave & Busters the perfect place to hang out, unwind and enjoy a totally unique kind of dinner. Board your motorcoach and depart for home.